The CanCham NEWS is to provide information about member activities. Members are encouraged to submit relevant news items to info@cancham.lv and provide links to their web sites to provide details. 23.04.2019 In order to develop CanCham’s DMC (Destination Management Coordinator) initiative, the Healthcare / Medical Tourism, Export and Trade Facilitation, and the Construction Related Services Groups are forming committees that will be meeting on a regular (monthly) basis to develop action plans to promote the services of CanCham members, and to meet the objective of the CanCham by seeking business opportunities internationally. Members wishing to participate in these committees are invited to contact the Group Leaders or Board Members. 16.04.2019 An invitation for Easter from CanCham’s Corporate member Baltic Beach Hotel. 09.04.2019 CanCham’s DMC (Destination Management Coordinator) initiative was launched on March 26th, 2019 at the dinner with the Prime Minister of Latvia, Krišjānis Kariņš. A description of how the DMC system works has been posted in the CanCham web site, along with the applicable policy. We are now in the implementation phase connecting DMC’s to our members. 08.04.2019 CanCham Focus on Canada and the Canadian Embassy with H.E. Kevin Rex, Canadian Government Ambassador to Latvia has been rescheduled to Monday, May 13 at 18.30, from April 15th, 2019. Venue TBD. 28.03.2019 The Report on “Latvia as a Commercial Hub” with Prime Minister Krišjānis Kariņš was issued. 28.03.2019 Print eXpress joins the CanCham as a Business member. 26.03.2019 Latvian Shipping Hawks renews its Business membership. 18.03.2019 Smart Continent LV – Ekoterm renews its Individual membership. 11.03.2019 The Baltic Beach Hotel joins the CanCham as a Corporate member. 11.03.2019 Registrations begin for the CanCham dinner “Latvia as a Commercial Hub with Prime Minister Krišjānis Kariņš and Foreign Minister Edgars Rinkēvičs on Tuesday, March 26th, 2019 at 18.00 at the Radisson Blu Latvija Hotel”. 15.02.2019 Continett renews its CanCham membership as a Business member. 15.02.2019 The Report on CanCham’s Focus on Export was issued. 14.02.2019 CBRE Baltics joins the CanCham as a Corporate member. 14.02.2019 The Report on CanCham's Focus on Construction Related Services was issued. 29.01.2019 CanCham’s Focus on Healthcare and Strategic Partners on Monday, February 18th at 18.30 at the Unity Business Centre, 109 Vienības gatve is open for registrations. 25.01.2019 Satori Alfa joins the CanCham as a Corporate member. 23.01.2019 AmberWork joins the CanCham as a Business member. 02.01.2019 The CanCham Implementation Strategy for 2019 is issued for discussion purposes as a guide for the next year’s activities. 27.12.2018 Exupery International School joins the CanCham as a Corporate member. 14.12.2018 Circle K renews its Corporate membership. 09.12.2018 The Report on CanCham Christmas 2018 – supporting “Nāc līdzās!” was issued. We are pleased to have raised €1,320 for Fonds Nāc līdzās, €300 of which was donated by our member Zemnieku saimniecība Medīgas and €1,020 from raffle ticket sales. Thanks to all who supported the effort. Wishing all a Merry Christmas and a Happy New Year! 04.12.2018 Inta Consulting renews its individual membership. 04.12.2018 Granitops upgrades their membership from Individual to Corporate. 30.11.2018 Latvia Dental renews its Business membership. 30.11.2018 VestaFume renews its Business membership. 29.11.2018 Baiba Liepiņa renews her Associate membership. 28.11.2018 R Birojs renews its Corporate membership. 27.11.2018 Divine Heat renews its Business membership. 27.11.2018 Kronbergs Čukste Levin renews its Corporate membership. 21.11.2018 Kavitvana joins the CanCham as an Individual member. 20.11.2018 Business after hours with Bite Latvia in a Joint Chamber event with the Irish Chamber of Commerce in Latvia, Thursday, November 22nd, 2018 is SOLD OUT. Registration no longer being accepted. 12.11.2018 The Report on Focus on Trade with Canada with Dr. Brent McKenzie, Associate Professor at the University of Guelph, Ontario, Canada and sponsored by the Canadian Embassy was issued. 02.11.2018 Registrations open for CanCham’s Focus on Trade with Canada with Dr. Brent McKenzie, Associate Professor at the University of Guelph, Ontario, Canada Sponsored by the Canadian Embassy in Latvia. 02.11.2018 The Report on CanCham’s Focus on Exports and Strategic Partners was issued. 01.11.2018 Registrations open for the CanCham Christmas. 01.11.2018 Registrations open for the Bite Business After Hours event for CanCham members and CAF personnel only. 12.10.2018 The Canadian Embassy invites members and friends to attend EUCAN 2018. 03.10.2018 The Report on CanCham’s Canadian Thanksgiving Dinner 2018 was issued. 03.10.2018 The report on the Canadian Chamber of Commerce in Latvia Annual General Meeting was issued. 24.09.2018 The Report on CanCham’s Participation in the V International East Baltic Business Forum in Daugavpils from September 20th to the 21st, 2018 was issued. 14.09.2018 The Report for CanCham’s Focus on Exports and Strategic Partners was issued. 10.09.2018 The International School of Riga joins the CanCham as a Corporate member. 10.09.2018 Jauna Forma joins the CanCham as a Business member. 09.09.2018 The Notice and Agenda for the Annual General Meeting (AGM) of the Canadian Chamber of Commerce in Latvia has been sent to members. It will take place at 18.30 on October 1st, 2018 at the RBS. 03.09.2018 SilvEXPO renews its Business membership. 26.08.2018 Registrations open for CanCham’s Focus on Exports and Strategic Partners on Monday, September 10 at 18.30 at the Unity Business Centre, 109 Vienības gatve. Register here http://cancham.lv/events/focus-on-exports-and-strategic-partners. 21.08.2018 PK Serviss renews its Corporate membership. 15.08.2018 Rohit Madaan joins the CanCham as an Individual member. PK Service, a construction services company. 31.07.2018 Energolukss renews its Corporate membership. 22.07.2018 The upcoming events calendar has been updated. 09.07.2018 Singh’s Indian Restaurant and Bar renews their senior corporate member level. We thank Singh’s for the support. 09.07.2018 The report on CanCham’s Canada Day celebration was issued. 06.07.2018 Leinonen joins the CanCham as a Corporate member. 01.07.2018 Ričards Stūris joins the CanCham as an Individual member. 28.06.2018 Ozols America (Richard Hunter) joins the CanCham as an Individual member. 26.06.2018 Siemens renews its Corporate membership. 22.06.2018 Volko Engineering renews its Business membership. 21.06.2018 Mercure Riga Centre Hotel renews its Corporate membership. 19.06.2018 Cannelle Bakery renews its Business membership. 19.06.2018 Prime Recruitment renews its corporate membership. 18.06.2018 Zvērināta Advokāta Paula Jansona Birojs (lawyer) renews its Individual membership. 18.06.2018 Gosselin Mobility renews its Business membership. 15.06.2018 The Latvian American Eye Centre renews its Business membership. 15.06.2018 Indian Raja Restaurant renews its Corporate membership. 14.06.18 Focus on Restaurants and Dining: CanCham members are pleased to welcome visitors for unique dining experiences in Riga. 14.06.2018 Vaderstad renews its Corporate membership. 14.06.2018 BG Real Estate renews its Business membership. 13.06.2018 ISKU renews its Corporate membership. 12.6.2018 Canada Day 2018 (July 1st) registrations starts. 29.05.18 Focus on Medical Services: For visitors to Latvia – Latvia offers competent medical services at democratic prices. If the need arises or you wish to take advantage of the benefits, visit CanCham members for reliable service. 29.05.2018 An invitation to Canadians in Canada. The CanCham is looking for strategic partners for its members. 25.05.2018 Canadian Chamber of Commerce in Latvia (CanCham) - Privacy and Personal Data Policy comes into effect. 15.05.2018 LaNoDe joins the CanCham as a Business member. 14.05.2018 The report on the CanCham’s Focus on Energy, Economics and Politics with Krisjanis Karins was issued. 05.05.2018 Reminder about CanCham Focus on Energy, Economics and Politics with Krisjanis Karins, Wednesday, May 9, at 14.00 at Singh’s Restaurant. Register http://cancham.lv/events/karins. 03.05.2018 Aerones joins the CanCham as a Corporate member. 17.04.2018 Bravissimo joins the CanCham as a Business member. 11.04.2018 Web Media Kings joins the CanCham as a Corporate member. 09.04.2018 The report on the CanCham’s Focus on Money, with Dana Reizniece-Ozola, Minister of Finance was issued. 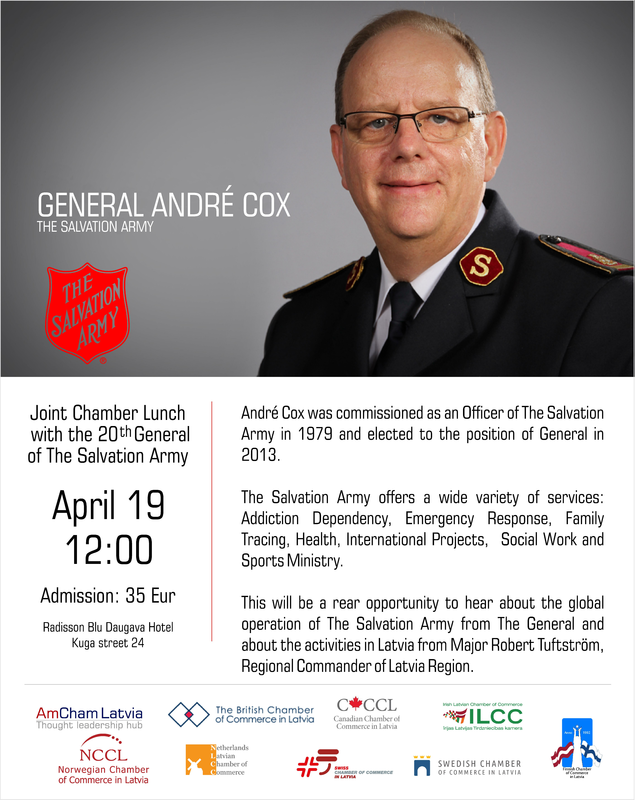 04.04.2018 Registrations open for the Joint Chamber Event with the Salvation Army Register her http://cancham.lv/events/salvation-army. 04.04.2018 Last Call for Focus on Money with the Minister of Finance this Thursday at 18:30 at the Grand Palace. Register here http://cancham.lv/events/money. 28.03.2018 Arms Group renews its membership and upgrades to Corporate. 18.03.2018 The report on the CanCham’s Focus on Connecting Canada and Latvia with Artis Pabriks issued. 12.03.2018 The report on the Canadian Chamber of Commerce in Latvia organized missions was issued. 07.03.2018 Crea Promotion renews its individual membership. 06.03.2018 Džeza Bārs – Trompete renews its Business membership. 05.03.2018 Kronbergs Čukste Derling renews its Corporate membership. Information about the mission can be found in http://cancham.lv/docs/961/Missions/to_Latvia.pdf . Registering interest for participating at http://cancham.lv/events/latvia-2018. Any questions or comments – please write to Ed Kalvins at ed.kalvins@cancham.lv. registering for the mission – Friday, March 16th, 2018. 01.03.2018 H. E. Kārlis Eihenbaums, Ambassador of Latvia to Canada, endorses the “Connecting Canada and Latvia” initiative of the Canadian Chamber of Commerce in Latvia which brings value-added benefits for Latvian companies entering the Canadian market and Canadian companies investing in Latvia’s future. 16.02.2018 ZS Medigas joins the CanCham as an Individual member. 15.02.2018 Radisson Blu Daugava Hotel renews its Corporate membership. 11.02.2018 LPKS Rūjienas oga joins the CanCham as a Business member. 11.02.2018 Canada to Riga Business Mission between Thursday, March 29th to Sunday, April 8th 2018 program updated with visits to the Latvian Parliament, Circle K Business Centre and airBaltic, and reception at the Canadian Embassy in Latvia. 09.02.2018 Report on Creating Visibility issued. 29.01.2018 H. E. Alain Hausser, Ambassador of Canada to Latvia, endorses the “Connecting Canada and Latvia” initiative of the Canadian Chamber of Commerce in Latvia and fully supports its objectives to develop strategic partnerships between the business community in Canada and the same in Latvia in order to promote economic activity between the two countries, and in particular, to take advantage of the benefits offered by the Comprehensive Economic and Trade Agreement known as CETA. - Canada to Riga between Thursday, March 29th to Sunday, April 8th 2018. - Register your interest at http://cancham.lv/events/canada-2018. For more information, contact Ed Kalvins at ed.kalvins@cancham.lv. 15.01.2018 Circle K renews its Corporate membership. 15.01.2018 The CanCham wishes the musical bar and restaurant Trompete a Happy 2nd birthday as the occasion was celebrated with the JOKER DIXIE +Jam Session. 10.01.2018 airBaltic Corporation renews its Corporate membership. 29.12.2017 Latvian Shipping Hawks renews its Business membership. 28.12.2017 Radisson Blu Latvia Conference & Spa Hotel renews its Corporate membership. 28.12.2017 Inta Consulting renews its individual membership. 14.12.2017 Enjoy the Festive Season at the Grand Palace Hotel. 14.12.2017 The CanCham Christmas supporting “Nāc Līdzās!” on December 8th has come and gone and the report issued. Please check to see the main donors at http://cancham.lv/sponsors. 08.12.2017 X-Infotech renews its Corporate membership. 06.12.2017 Baiba Liepina renews her Associate membership. 05.12.2017 Normunds Medens renews his individual membership. 05.12.2017 Arvīds Godjuks renews his individual membership. 01.12.2017 Latvia Dental renews its Business membership. 30.11.2017 SilvEXPO renews its Business membership. 30.11.2017 Smart Continent LV – Ekoterm renews its Individual membership. 23.11.2017 Report on the occasion of the National Day of Romania. 17.11.2017 VestaFume renews its Business membership. 14.11.2017 Report on Expert Seminar on Accounting with R Birojs on “the new (2018) tax law and its implications on business". 12.11.2017 JLB Consulting joins the CanCham as a Business member. 09.11.2017 R Birojs renews its Corporate membership. 09.11.2017 Report on Riga Comm 2017, opening ceremony at the Taiwan booth. 05.11.2017 A new schedule of events has been posted. 10.11.2017 Report on the on the meeting between Altum and Cancham on Financing Development issued. 02.11.2017 It has become a CanCham tradition to celebrate the Christmas season by thinking about those in less fortunate than ourselves. As we did last year, we will be supporting “Nāc līdzās!” (Come along!) which supports children and young people with disabilities to integrate into society, and helps their parents’ understand the problems that they face. Vaira Vīķe-Freiberga is the patroness of the charity. See http://www.naclidzas.lv/en/about-us. If you would like to donate a gift for our raffle, please see http://cancham.lv/news/sponsorship-request-for-cancham-christmas-2017. To register for the event, please visit http://cancham.lv/events/cancham-christmas-2017. 02.11.2017 CanCham Group Leaders meeting. To register visit http://cancham.lv/events/group-leaders-meeting-2011. 01.11.2017 The CanCham congratulates Kalupe (http://www.kalupesrotas.lv/) on it’s 60th anniversary and its owner, Tālis Kivlenieks, for keeping up the traditions of creating artistic jewellery utilizing ethnographic folk elements started by his parents in Toronto in 1957. 25.10.2017 Report on the October Seed Forum in Riga (for start-ups). 11.10.2017 Report on CanCham’s Canadian Thanksgiving Dinner issued. Alda Zeiļa joins the CanCham as an Individual member. 09.10.2017 FF INTERNATIONAL MOVERS joins the CanCham as a Corporate member. 08.10.2017 Financing Development: CanCham members sent a notice / survey enquiring as to what members would are interesting in meeting with an Altum representative to answer questions and concerns and possibly get closer to obtaining financial support for projects, working capital, etc. For information, write to Inta Cinīte at info@cancham.lv. 06.10.2017 Report on the occasion of the 106th ROC National Day celebrations. 04.10.2017 Andrejs Šķesters joins the CanCham as an Associate member. 03.10.2017 Report on CanCham’s AGM issued. 02.10.2017 Alus Nams (Brālis Brewery) renews its Corporate membership. 02.10.2017 Divine Heat renews its membership and upgrades to Business. 02.10.2017 Amber Pool renews its Business membership. 02.10.2017 Milad Asdaghi joins the CanCham as an Individual member. 27.09.2017 Report on Connecting Canada and Latvia - meetings between CanCham representatives and potential business partners in Toronto issued. 27.09.2017 VPH (Venturecorp Property Holdings Limited) joins the CanCham as a Corporate member. 15.09.2017 Inta Cinīte representing CanCham attends the reception in honour of the visit of the Honourable George J. Furey Q.C., Speaker of the Senate, and a Parliamentary Delegation to Latvia. 09.09.2017 Report on Business after hours with Circle K Latvia at the Circle K Business Center issued. 04.09.2017 All Logo Chocolate (Luxus Chocolate) joins the CanCham as a Business member. 01.09.2017 MON Projekts joins the CanCham as a Corporate member. 24.08.2017 Krinner.lv renews its Corporate membership. 22.08.2017 Information for CanCham members and those interested in doing business with Canada. We are presenting the Canadian Chamber of Commerce in Latvia to the Canadian business community in Toronto on September 19th, 2017. 11.08.2017 Alma family doctor's private practice joins the CanCham as a Business member. 06.08.2017 Registrations open for the reception at the Latvian Canadian Cultural Centre at 4 Credit Union Drive, Toronto on Tuesday, September 19th, 2017 at 18.00. 06.08.2017 Registrations open for the Business After Hours with Circle K (ex Statoil) on Tuesday, September 5th, at 17.00. 31.01.2017 Kārlis Sarkans renews his Individual membership. 30.07.2017 The Report on Business after hours with airBaltic, Monday, July 24, 17:00 – 19:00 (Riga time) has been issued. 27.07.2017 Zvērināta Advokāta Paula Jansona Birojs renews its Individual membership. 26.07.2017 18.05.2015 Volko Engineering renews its Business membership. 20.07.2017 Grand Palace Hotel renews its Corporate membership. airBaltic Business After Hours sold out. 21.07.2017 – CanCham reception at the Latvian Canadian Cultural Centre at 4 Credit Union Drive, Toronto regarding business opportunities with Latvia. Attendance by invitation only has been set for Tuesday, September 19th, 2017 at 18.00. Please contact Ed Kalvins at ed/kalvins@cancham.lv if interested in attending. 2.07.2017 CanCham’s Chairman, Ed Kalvins, will be in Toronto from Wednesday, September 13th to Thursday, September 21st, 2017 meeting with potential business partners for CanCham members. Subjects for discussion include import/export possibilities, strategic partnerships and investments. Members interested in cooperation with Canada should contact Ed Kalvins at ed.kalvins@cancham.lv to advise of their interests. 11.07.2017 Singh’s Indian Restaurant and Bar upgrades to senior corporate member level and becomes the first CanCham member in this category. We thank Singh’s for the support. 07.07.2017 CanCham’s Corporate member, Radisson Blu Latvia Conference & Spa Hotel of the Rezidor Hotel Group, announces that Michael Jacobi, (formerly General Manager of the Radisson Blu Latvia Conference & Spa Hotel) has been appointed as the Regional Director for the Baltics and Ukraine as of July 1, 2017. He is responsible for all 18 Rezidor properties in the Baltic states and Ukraine. Meanwhile, Gerhard Erasmus has been appointed as the General Manager for the Radisson Blu Latvia Conference & Spa hotel, while the Radisson Blu Elizabete and Radisson Blu Ridzene from now on will be managed by the new General Manager, George Miu. 07.07.2017 The CanCham Chairman will be in Canada from September 13th to the 20th for meetings with Canadian business partners who could be interested in business opportunities in Latvia or Northern Europe. These opportunities could include export/import, investments, establishing businesses or seeking strategic partners. 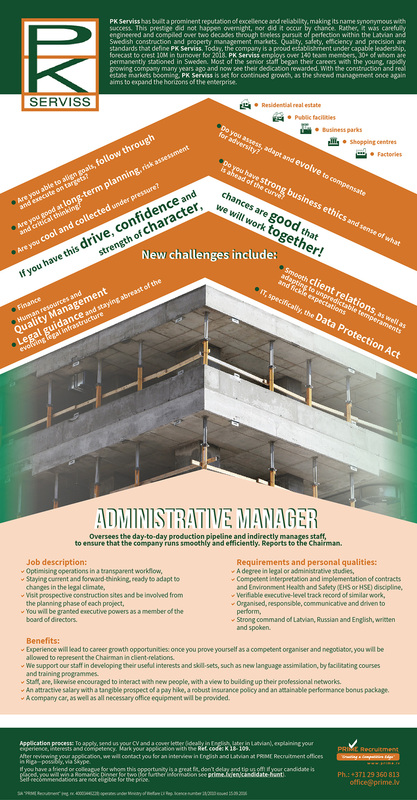 Interested parties please contact Ed Kalvins at ed.kalvins@cancham.lv. 06.07.2017 The invitation to Business after hours with airBaltic, Monday, July 24, 17:00 – 19:00 (Riga time) has been issued. 02.07.2017 The Report on Canada’s 150th birthday with the CanCham in Latvia has been issued. The CanCham wishes all its members and friends a joyful Līgo festival to experience the Midsummer Night's Magic, together with a beautiful and song filled summer solstice holiday! Lai visiem līksmi Līgosvētki un izdodas sajust Jāņu nakts burvību!!! Novēlam skaistus un skanīgus vasaras saulgriežu svētkus! 17.06.2017 review of on Celebrating Latvia – a warm up to “Jāņi” with a plant tour of the Brālis Brewery has been posted. 14.06.2017 Happy Birthday Brālis: The Canadian Chamber of Commerce in Latvia wishes CanCham’s Corporate Member Brālis (brewery “Brother”) a “Happy Birthday” and thanks them for their excellent product line. Please keep it coming. For those of you who want to wish them well personally, please join us for a plant tour this Friday. Register at http://cancham.lv/events/bralis, info at http://cancham.lv/events. 15.06.2017 Prime Recruitment renews its corporate membership. 07.06.2017 A review of “Celebrating Canada” with H.E. Alain Hausser, the Canadian Ambassador to Latvia has been posted. 05.06.2017 The latest news summary from CanCham. 01.06.2017 Abens Konsultants joins the CanCham as an Individual member. 01.06.2017 RIPO INTERNATIONAL Ltd joins the CanCham as a Business member. 30.05.2017 Vladimirs Čamāns joins the CanCham as a Business member. 07.04.2017 ISKU upgrades to Corporate membership. 09.05.2016 Kalupe joins the CanCham as an Individual member. 09.05.2017 VERTEXA renews its Corporate membership. 02.05.2017 PK Serviss renews its Corporate membership. 21.04.2017 Vaderstad renews its Corporate membership. 11.04.2017 A review of “Rail Baltica – project of the century” with Baiba Rubesa has been posted. 07.04.2017 Tele2 joins the CanCham as a Corporate member. 07.04.2017 ISKU joins the CanCham as a Business member. 06.04.2017 Controlit Factory joins the CanCham as a Corporate member. The Grand Palace Hotel invites you to enjoy their famous Easter brunch on Sunday, April 16. Singh’s Restaurant invites you come celebrate Sikhs Vaisakhi Festival (New Years) on April 13th and 14th. Free beer. 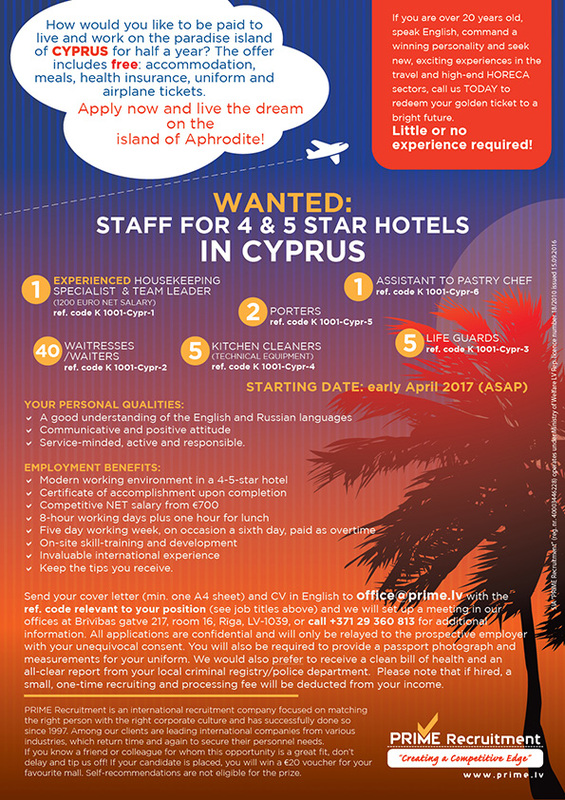 05.04.2017 Prime Recruitment recruiting staff for 4 & 5 star hotels in Cyprus. 05.04.2017 “Nāc Līdzās!” (Come along) invites you to attend “Lielkoncerts” on April 11th, 2017, at 12.00 at the RSU Aula (Riga Stradinu Hospital Hall). 31.03.2017 IIZI Brokers joins the CanCham as a Corporate member. 21.03.2017 Report on “Greens Night” issued. 10.03.2017 Gosselin Mobility Baltics joins the CanCham as a Business member. 09.03.2017 Indian Raja joins the CanCham as a Corporate member. 07.03.2017 Report on CanCham PfP Work Group Meetings issued. 06.03.2017 Continett joins the CanCham as a Corporate member. 06.03.2017 Dr Barloti joins the CanCham as an Individual member. 24.02.2017 Report on Taiwan Evening issued. 23.02.2017 CETA ratified by Latvian Saeima (parliament). To date: Canada – ratified by parliament, going through Senate, Needs Royal approval. EU – ratified by EU parliament, needs member state ratification. Latvia #1. Provisions expected to take effect April, 2017. 17.02.2017 Siemens joins the CanCham as a Corporate member. 15.02.2017 CETA approved by the EU parliament. This paves the way for it to take provisional effect once the Canadian Senate gives its green light, expected within weeks. EU governments and Canada’s House of Commons have already given their approval. 01.02.2017 H.E. Alain Hausser, Ambassador Extraordinary and Plenipotentiary of Canada to Latvia presented information about CETA. 31.01.2017 Cannelle Bakery joins the CanCham as a Business member. 30.01.2017 Pjotrs Kurtukovs joins the CanCham as an Individual member. 27.01.2017 Report on Mobilization issued. 26.02.2017 Energolukss joins the CanCham as a Corporate member. 25.01.2017 BG Real Estate joins the CanCham as a Business member. 21.01.2017 Statoil Fuel and Retail is now known as Circle-K with the logo change from Statoil to Circle-K.
17.01.2-17 Rigers Architect Paegle Project Office renews its Individual membership. 16.01.2017 The Latvian American Eye Centre joins the CanCham as a Business member. 14.01.2017 We congratulate Trompete on its first anniversary celebration. 12.01.2017 Statoil Fuel & Retail renews its Corporate membership. 10.01.2017 Arrangements set for “Mobilization” with Artis Pabriks at the Grand Palace Hotel on Thursday, January 26th, 2017 at 18.30. 10.01.2017 Transcontinental Consulting Company renews its Individual membership. 05.01.2017 Latvia Dental renews its Business membership. 03.01.2017 Websoftsites renews its Corporate membership. 30.12.2016 Radisson Blu Latvija Conference & Spa Hotel joins the CanCham as a Corporate member. 28.12.2016 Kronbergs Čukste Derling renews its Corporate membership. 07.12.2016 The CanCham Christmas supporting “Nāc Līdzās!” has come and gone. Read the report at http://cancham.lv/events/report-on-cancham-christmas-2016--supporting-nac-lidzas- and see who the sponsors were at http://cancham.lv/sponsors. 28.11.2016 The CanCham has activated its Business Development Groups. Group leaders are identified in http://cancham.lv/about-cancham/business-development-groups. Their task will be to help members find clients. 25.11.2016 Air Baltic Corporation joins the CanCham as a Corporate member www.airbaltic.com/lv-LV/index. 25.11.2016 Radisson Blu Daugava Hotel joins the CanCham as a Corporate member www.radissonblu.com/en/hotel-riga. 25.11.2016 Eriks Seminovs joins the CanCham as an Individual member. 06.11.2016 Information updated for “Flying to Canada? Learn about Canada’s new entry requirements!” see http://cancham.lv/info-for-canadians. 30.10.2016 Prime Minister Justin Trudeau and European leaders today signed the Comprehensive Economic and Trade Agreement known as CETA, after seven years of negotiation. CETA will be a major discussion point with Latvia’s Economics Minister, Arvils Ašeradens, at CanCham’s Wednesday, November 3rd, event at the Radisson Latvia Hotel – see http://cancham.lv/events. 27.10.2016 Latest on CETA - back on track. Approved by Belgium. see http://www.bbc.com/news/world-europe-37788882. 26.10.2016 CanCham planning Christmas event on Monday, December 5th. Details later. We welome members and friends. 19.10.2016 We are preparing for the November 3rd event with the Economics Minister. Three members have the opportunity to present their companies. For details, write to info@cancham.lv. 19.10.2016 Singh’s Indian Restaurant and Bar joins the CanCham as a Corporate member www.singhs.lv. 13.10.2016 Ed Kalvins, participated in the Seed Forum Investor Networking event. See www.facebook.com/canchamlatvia/. 13.10.2016 The CanCham congratulates our corporate member X Infotech on its 10th anniversary. 11.10.2016 The report for the Canadian Thanksgiving Dinner is available at www.facebook.com/canchamlatvia/ and http://cancham.lv/events/report-on-the-canadian-thanksgiving-dinner. 07.10.2016 CanCham representatives participated in the Taipei Mission in Latvia reception celebrating the 105th anniversary of the Republic of China. See www.facebook.com/canchamlatvia/posts/1259930494070160. 05.10.2016 MUSA Race Land joins the CanCham as a Corporate member. 23.09.2016 A review of the NATO Force Integration Unit Latvia - Providing Security for Business Growth and Investments luncheon event is posted at http://cancham.lv/events/report-on-the-nato-force-integration-unit-latvia---providing-security-for-business-growth-and-invest. 12.09.2016 Information regarding the upcoming Annual General Meeting of the CanCham has been sent to members. Please register your attendance here - http://cancham.lv/events/agm. If members did not receive the information, please let us know at info@cancham.lv. 12.09.2016 The CanCham is co-hosting the Business Lunch NATO Force Integration Unit Latvia - Providing Security for Business Growth and Investments on September 22nd, Thursday, 11.30. 08.09.2016 CanCham member Olga Melnikova of CREA Promotion invites all to “Shakespeare lives in Films 2016”, See http://www.creapromo.com/shakespeare-lives-in-films-2016/. 08.09.2016 A review of the “Launch of CanCham’s Governance Program”” event has been posted http://cancham.lv/events/report-on-the- and www.facebook.com/canchamlatvia. 02.09.2016 Guna Skangale joins the CanCham as an Associate member. 01.09.2016 X-Infotech joins the CanCham as a Corporate member www.x-infotech.com. 31.08.2016 Today’s edition of the Partnership for Profit (PfP) orientation: Henrik Mjoman (Prime Recruitment), Lorens Levickis (VipAuto PLUS), Stefan Westberg (Divine Heat /NIBE), Karina Krivorota (Grand Palace Hotel), Dace Kavasa (Evolve1x2x3), Nikita Kocanovs (OBERON), Kristaps Loze (Loze & Partneri), and Ed Kalvins (Technical Partners). Next session – September 14th. 30.08.2016 VestaFume TLG joins the CanCham as a Business member. 28.08.2016 The CanCham invites its members to present their company at CanCham events. See details at https://www.facebook.com/canchamlatvia/. 26.08.2016 The CanCham is co-hosting the NATO Business Lunch with the international and local business community together with the Norwegian Chamber of Commerce in Latvia and the American Chamber of Commerce in Latvia on September 22nd, Thursday, 12.00. 25.08.2016 Today’s Partnership for Profit (PfP) orientation graduating class: Atis Riekstiņš (GTD Europe), Imants Stonans (Hi-Fab), Henrik Mjoman (Prime Recruitment), Iļja Djadjura (VIS Brokerhouse), Janis Loze (LOZE & PARTNERS), Eduards Bukovskis (Secure), and Ed Kalvins (Technical Partners). Next session – August 31st. See https://www.facebook.com/canchamlatvia/. 24.08.2016 Today’s Partnership for Profit (PfP) orientation graduating class: Romans Astapovs (Print Group), Henrik Mjoman (Prime Recruitment), Natalie Malina, (Latvia Dental), Dzintra Renigere (R Birojs), Anda Vilemsone (Latvian-American Eye Centre), Jelena Razdorova (X-Infotech), Antons Maximovs (Latvia Dental) and Ed Kalvins (Technical Partners). 23.08.2016 R Birojs joins the CanCham as a Corporate member http://www.rbirojs.lv/lv/. 18.08.2016 The Partnership for Profit program orientation for members scheduled for August 24th has been sold out. August 25th and 31st still available. See http://cancham.lv/events/upcoming-events. 14.08.2016 Upcoming events updated today. See http://cancham.lv/events/upcoming-events. Partnership for Profit program orientation for members scheduled for August 24th, Wednesday, 16.00, and the Launch of the Governance Program takes place on September 7th, Wednesday. 20.07.2016 The Exports, Investments, Strategic Partners, and meet the new Latvian Ambassador to Canada event at the Pullman Hotel was a roaring success with attendance pushing the 50 mark. See http://cancham.lv/events/report-on-ambassador-event and https://www.facebook.com/canchamlatvia/photos/?tab=album&album_id=1187670321296178. 11.07.2016 Attaché Baltique joins the CanCham as a Business member info@attachebaltique.com. 11.07.2016 The Canadian Embassy maple tree planting ceremony in Bastion Hill park (Bastejkalna parkā) to commemorate the occasion of the 25th anniversary of the re-establishment of Canada-Latvia diplomatic relations with Canadian Foreign Minister, Stéphane Dion and Latvian Foreign Ministry State Secretary Andrej Pildegovičs. 10.07.2016 Next CanCham event - Exports, Investments, Strategic Partners, and meet the new Latvian Ambassador to Canada at the CanCham Business Development Forum on July 19th, Tuesday, 18.30 at the Pullman Riga Old Town Hotel. See http://cancham.lv/events. 07.07.2016 The Canadian Embassy reception at the Latvian National Museum of Art on the occasion of Canada Day and the 25th anniversary of the re-establishment of Canada-Latvia diplomatic relations. 01.07.2016 A Forestry and Wood processing forum (see FORUM) will be taking place in Vancouver on September 21-24, 2016 as part of Demo International - 2016 www.demointernational.com. Our partners CERBA Vancouver would be happy with a side program arrangements for the incoming Baltic companies. If interested, contact the CanCham at info@cancham.lv. 19.06.2016 Sam Davidovich, the CanCham Board Member in Canada, attended a Canadian Council for the Americas www.ccacanada.com event featuring a presentation from The Honourable Chrystia Freeland, Minister of International Trade. 19.06.2016 The CanCham invites its members and friends to the CanCham Canada Day event at the Grand Palace Hotel http://cancham.lv/events/canada-day--party-time. Please pass the word to Canadians visiting Latvia. 17.06.2016 A review of the “Development Opportunities and Business Environment in Riga” event has been posted @ http://cancham.lv/events/report-on and www.facebook.com/canchamlatvia and invitations sent out for Canada Day on July 1st. Members and friends welcome. 08.06.2016 PRIME Recruitment is looking for a Hotel General Manager http://www.prime.lv/en/our-jobs. Reward being offer for help. 07.06.2016 CanCham and CERBA (www.cerbanet.org/) have entered into a cooperation agreement which covers projects, investment, strategic partners and general cooperation. Members interested in participating in such cooperation should inform the Board. 26.04.2016 GTD Europe joins the CanCham as a Individual member. 22.03.2016 Larry Chilton joins the CanCham as a Individual member. 20.03.2016 Riga Candles joins the CanCham as an Individual member www.rigacandles.com. 15.03.2016 "Grand Palace Hotel" in Riga has been nominated in 3 categories for the prestigious «World Travel Awards» award. See http://m.travelnews.lv/?pid=97948. Go to http://www.worldtravelawards.com/nominees/2016/latvia to vote for our corporate member. 14.03.2016 Notifications mailed for the Partnering for Profit program forum about “Financing Development”. See http://cancham.lv/events. 14.03.2016 The Economic Freedom Seminar that will take place on March 24th, Thursday at 15.00. See Economic Freedom Seminar. 10.03.2016 Henrik Mjoman is pleased to announce that Prime Recruitment has moved to new offices at Brivibas 217. See www.prime.lv/en/contacts. 09.03.2016 The Embassy of Canada in Latvia has the pleasure to invite you to the 5th Francophone Film Days and to the screening of the captivating Canadian drama (2015) “La Passion d'Augustine” by Léa Pool. The film is in French with English subtitles and Latvian simultaneous translation. www.facebook.com/events/489622984558792/. 07.03.2016 BioMark joins the CanCham as a Corporate member www.biomark.lv. 29.02.2016 PK Serviss joins the CanCham as a Corporate member www.pkserviss.lv. 24.02.2016 Mercure Riga Centre by Deal Top"> Hotel offers discounts to members. http://cancham.lv/cancham/promotions. 24.02.2016 The Embassy of Canada in Latvia will participate at the International education fair "SKOLA 2016" taking place from February 26 – 28 at Kipsala Exhibition Hall in Riga (Street Kipsalas 8). “SKOLA 2016” is the biggest and most popular annual international education event for participants and more than 17000 (number of visitors in 2015) students, parents, teachers and guidance counsellors. For Canada, “SKOLA 2016” is a major promotional opportunity to attract high quality students and young professionals, and to make Canada a part of students’ long term plans. For more information, please visit: http://www.bt1.lv/skola. 24.02.2016 On February 18th, the first Statoil Fuel & Retail convenience store in Latvia opened its doors In the heart of Riga’s Old Town at Vaļņu iela 11. For additional info please see Statoil Vestule LV and Statoil Letter ENG. 21.02.2016 Next event - March 9th, Wednesday, Business After Hours at Latvia Dental http://www.latviadental.eu/. 08.02.2016 ALLIKS un PARTNERI joins the CanCham as an Individual member www.alliks.lv. 2.02.2016 The invitation for the Meet the Members networking and socializing event at Antica Roma – Italian Restaurant http://www.anticaroma.lv/ is out - see http://cancham.lv/news/meet-the-members-networking-and-socializing-event- to register. Friends - this is your chance to find out what makes the CanCham good for business. 29.01.2016 Partnership for Profit orientation program underway. Members can chose suitable dates. See http://cancham.lv/news. 25.01.2016 Invitations to the Partnership for Profit program will be sent out to members only in the next two days. 14.01.2016 Dinner with Artis Pabriks on the topic of EU-Canada free-trade agreement (CETA). Main message for Latvian small and medium sized companies – this is for you. A review of the event can be found at http://cancham.lv/news and https://www.facebook.com/canchamlatvia/. 09.12.2015 E. Kalvins and I. Sproģe-Kalviņa meet Antonio Sugaroni of Antica Roma (http://www.anticaroma.lv/) to discuss upcoming events in 2016. 23.11.2015 E. Kalvins and H. Mjoman meet with Taipei Mission representatives to discuss cooperation between the CanCham and Taiwan. 05.11.2015 The Canadian Ambassador to the Republic of Latvia and Honorary Chairman of the Canadian Chamber of Commerce in Latvia, H.E. Alain Hausser, hosted a post-election event at the Canadian Embassy. 19.10.2015 E. Kalvins meets with H.E. A. Hausser and I. Cirule of the Canadian Embassy to review CanCham – Embassy cooperation.